Communication is the skill that we all benefit from. No matter if we’re customer service agents, managers or graphic designers – we all need to communicate to get the job done. Regardless of the role that we have in a company, the important thing is that the communication always has to go both-ways. If you tell somebody that they should do something and don’t hear back from them, then there’s a perfect illusion of a communication where, in fact, it didn’t actually happen. I hope that the communication quotes stated below will remind you why communication is crucial when it comes to working together. You will also learn the parts of communication that you might not pay attention to. Enjoy! When it comes to working together, communication is the most important skill that any leader can have. Having a vision that drives us towards building a company is one thing. The other is the ability to communicate with your employees. There are tons of reasons why leaders should do it. For example, if leaders want their employees to be engaged, they need to find a way to build a relationship that will allow them to share their vision, so employees can execute it. Without it, there are just employees who work and leaders who want to conquer the world. Nobody wants that, so if you’re a leader, find a common language with your workers and practice it on a daily basis. It’s simple. When you talk, you just repeat what you already know. When you listen, you might learn something new. Isn’t that exciting? There’re people who may think: “I don’t know how to discuss, I didn’t learn it in the past.” Well, that’s not an excuse for a constant bad communication. There are so many books about communication on the market! Take for example “Just Listen,” by Mark Goulston. It has helped tens of thousands of people tear down walls and establish productive communication. This book basically teaches you how to listen effectively, how to make even a total stranger a potential customer and how to shift an angry person into a calmer one. You can learn how to transform hopeless cases, like unreachable people, into true allies, loyal customers or even lifelong friends. You know people, who always try to win the discussion? Sometimes it’s a salesman who makes odd faces when you don’t know enough about the equipment he’s selling. Other times it’s your teammate who needs to prove that he knows better than you. These people have an issue with their ego and unfortunately they’re killing the conversation. When you always want to have the last word, when you believe that you’re the only one right, you don’t get the other person’s perspective. So, if you forget about “you” for a second – you might be able to listen, understand their perspective and have a healthy discussion. How many times have you explained to your teammate how to perform a task and you were certain that they understood everything? Then, it turned out they had no clue on what they were supposed to do but they didn’t give you any feedback. And all you can think of is: “I thought everything is clear. We talked about it.” Here’s the question: Did both of you talked about it, or really it’s just you who talked about it? To communicate effectively, we must realize that we are all different when it comes to world perception. When we will realize that, we can use it as a guide to our communication with others. Why is nonverbal communication important, especially at work? Because many times people say what they think they supposed to say and not what they really think. The most popular case that we all know is when people say they’re fine, but everything shows you that it’s quite the opposite. The body language can reveal a lot. Facial expressions, hand movements, posture, eye contact… these are the factors that can tell you a lot about the other person. If you will observe and listen carefully, you will notice things that you haven’t before. Nonverbal communication is the single most powerful form of communication. It’s worth to devote some time to learn it. Quotes on communication – let’s work on it! 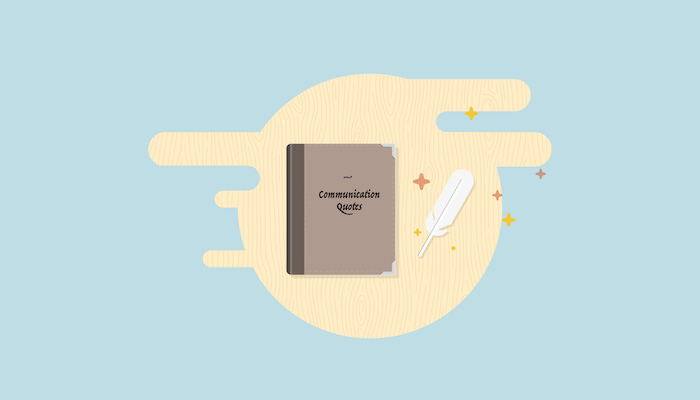 I hope that these quotes on communication will inspire you to work on it. After all, every day we communicate in thousand different ways, not only face to face but also via phone, chat and email. We still need to improve the way we formulate our thoughts and how to better understand others. We also have to learn how to interpret things that haven’t been said, as they can tell us a lot. If you liked this article, you might want to read: Troubles with Online Communication – Things You Should Know.